New York - Juliet Sandler dresses in the latest $650 dresses and $400 shoes from Parisian fashion house Lanvin. Juliet is 3. Her mother, Dara Sandler, says she dresses her daughter in the latest fashions because Juliet is a reflection of her - even though her daughter can’t spell the names of the designers, let alone pay for their clothes. “I dress my daughter exactly the way I dress myself,” says the 33-year-old Manhattan mother, who spent $10,000 for her daughter’s summer wardrobe. She plans to spend a few thousand dollars more for fall. Top fashion designers are pushing more expensive duds for the increasingly lucrative affluent toddler demographic. This fall, Oscar de la Renta, Dolce & Gabbana, and Marni launched collections for the pint-sized. Luxury stores Nordstrom and Bergdorf Goodman are expanding their children’s areas to make room for the newcomers, many of them with higher price tags. Late last year, Gucci, which launched a children’s collection two years ago, opened its first children’s store on Manhattan’s Fifth Avenue. Some designer houses like Oscar de la Renta and Marni say they’re careful to keep the clothes appropriate for kids. But there are plenty of miniature versions of the adult looks that raise eyebrows because of their eye-catching prices and sophisticated styles. American households are expected to spend an average of $688 outfitting their children for school, says the National Retail Federation, and that includes supplies like pencils and notebooks. That’s most families. Some will spend $795 on Gucci backpacks or $1,090 on leopard print puffy coats from Lanvin. Sasha Charnin Morrison, fashion director at Us Weekly, admits that some of the clothes are outrageously prices. But, she says, things like $200 Gucci sneakers make her kids happy. “They’re a walking billboard of you. They’re a reflection of who you are, so if you are someone highly stylized, then you want to make sure your kids are the best-dressed kids out there,” she says. Critics say the trend promotes elitism. Only five years ago, the high-end children’s wear business was dominated by just a few major designers like Ralph Lauren, Burberry and Christian Dior. But the recent influx of others is the latest sign that affluent shoppers have gone back to splurging since the recession. And as the wealthy feel more comfortable about spending again, they increasingly want their kids to reflect themselves. It’s a “mini-me” phenomenon, says Robert Burke, a New York-based fashion consultant. “It feels good. It’s like one for me and one for you,” he says. The trend isn’t limited to Manhattan or Beverly Hills, but is occurring in other big cities like Boston and Chicago, he says. Sales of designer children’s wear are also strong in resort areas where retirees who tend to dote on their grandkids live, he says. Luxury children’s sales account for just a fraction, or just over 3 percent, of the $34 billion market, but it’s growing faster than the rest of the children’s wear and clothing market, according to NPD Group Inc., a research firm. For the past 12 months ended in May, children’s wear sales rose 4 percent, with the upscale component up 7 percent, according to NPD’s most recent data. That compares with a 3 percent rise for the overall clothing market. Designers, seeking more growth, are now looking at children’s wear as another way to deepen their relationship with their customers as well as reach out to new ones. The designers are targeting household incomes of at least $350,000, says Marshal Cohen, NPD’s chief industry analyst. That’s about seven times the U.S. median household income of $49,445. Many of the new designer entries are more expensive than some of the established brands like Ralph Lauren. Ralph Lauren’s cotton shirts for boys are priced about $59. In comparison, Dolce & Gabbana’s plaid shirts for boys run $190. Girl’s dresses are about $500. Nordstrom, whose designer kids clothes were limited to a few names like Burberry and Ralph Lauren, is adding a number of collections for kids from the likes of Marni, Marc Jacobs and Stella McCartney. 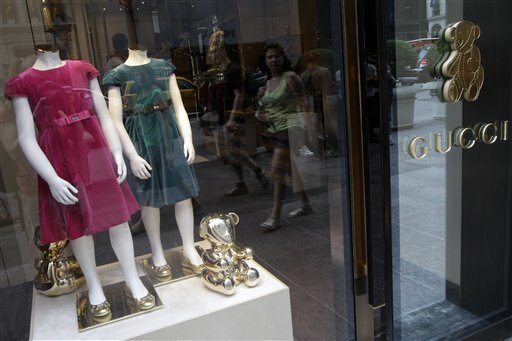 Neiman Marcus Group’s Bergdorf Goodman in Manhattan recently expanded its children’s wear department by a third to devote more space to Gucci and the new lines like Oscar de la Renta. For fall, the prices range from $4 for hair bows to $5,200 for an exclusive Christian Dior silk party dress handmade in France. The bigger trend, however, is designers creating free-standing shops devoted to kids, says Faith Hope Consolo, who leads retail leasing and marketing at Prudential Douglas Elliman. Following in the footsteps of Gucci, Italian fashion house Giorgio Armani will be opening this fall its first U.S. store devoted to children in Manhattan’s Upper East Side. Armani launched its children’s business in the U.S. in 2009.The Armani store, which targets newborns to teenagers, will feature items priced from $50 to $500, says Armani spokesman Christian Langbein. Some parents who are splurging say they also mix in shopping trips to Gap or other less-expensive stores, but see the designer duds as a confidence booster. “I really believe when she dresses like this, she feels better about herself,” added Sandler, who shops for pricey children’s clothes at Barneys New York as well as a New York women’s clothing store called Edit, which now has a designer children’s wear section. Manhattan resident Kelly Mallon, 39, says she’s proud that her 9-year-old daughter Madeleine has developed her own fashion sensibility. It's a "shanda" that parents spend so much on such frivolous things. These clothes can cost a fraction of its not a "name brand". Schools should forbid these thing immediately for the sake of parents who cannot afford these shtussim, but feel obligated from peer pressure and from wailing, crying kids. All the more reason for school infiorms. Spending like these women do is insane! Probably most people would consider this a waste of money and that the parents would be better off giving the excess to tzedaka instead. But the moronic statement by that shrink that it creates a culture of haves and have-nots and fosters envy is false. The haves have it whether they wear it or keep it in the bank. And envy is the fault of the envier, not the envied. What happens if you get marker or pen on the dress, skirt or blouse? If it does not wash out do you throw it in the garbage?? What nonsense!! I put my garbage into gucci bags and throw them out because the gucci bags or any other designer bag is made by the same illegal who makes the Target bag or the Kmart bag or any other low priced bag on the market. Parents who can afford designer wardrobe including bags and shoes should have to pay a surcharge of tripple tuition. Now let's see the groveling money yeshiva fundraisers agree to that! Oh NO! they're afraid to lose the big donors who they have to kiss up to! These people try to get a self esteem boost by wearing a label. I hope 13th ave will not become a catwalk for the new "Heimish Oscar De la Yenta"! What a great way to waste money. And an even better way to further spoil the kids rotten. This is soooo not consistent with a true Jewish Hashkofoh! Maybe, just maybe, if it's Likovod Shabbos and Yom-Tov, and the parents are well-to-do, that might justify such spending. And even then it would be a good idea to clarify to the child that this expense is in honor of Hashem's special days. My husband spends a lot more than I do on clothes! It's not all on the women! We will take that advice, when you stop spending $3,000 on wigs, $3000 on shtreimels, and $50000 on weddings. Feel the same way! Beyond sick!!!! I never got the point of dressing kids up in fancy clothing- they're just going to ruin the outfit anyway- babies spit up or have diaper explosions, bigger kids run around and get their clothes dirty or torn. The kids in the fancy duds either waste it all by dirtying them up, or miss out on being kids because their parents have to forbid them from acting their age so that they won't ruin the outfit. i hate to break it to you but plenty of yeshivish and chasidishe families go way over the top when it comes to spending money on children's clothing. I have 13 girls and 2 boys and love to dress up my girls in designer clothes. When I die, I can't take my money with me, so might as well spend it shopping for nice dresses. What's wrong with a parent doting on her lovely family? My neighbors do the same thing, so obviously, I'm not the only one who thinks like this. Why do you pick on Modern Orthodox when we all know very well that this phenomenon is found everywhere in Jewish neighborhoods. Are there no built-up McMansions in the "yeshivish" neighborhoods?Are the streets of Boro Park and Flatbush never filled with "expensively dressed"men, women and children on a regular weekday errand? I agree with you that we should all cut back on frivolous spending and consumption, but it really is not nice of you to start blaming MO for a behavior that is found in some people representing the gamut of Jewish Hashkafos. As odd as it sounds, the percentage of luxury labels purchased by chasidic women & children surpasses that of the modern orthodox. As an aside, my children (husband & myself) are dressed in Burberry, Dolce & Gabbana, Valentino, Armani etc. because I love well cut, well made clothing & I am a SAVVY SHOPPER. YES, YOU CAN LOOK LIKE A MILLION $ WITHOUT $PENDING IT!! unfortunately this galus is so deep that when frum people behave totally shallow and goyishlike this,they have no self awareness about it. Hmmm.. are you kidding????? My own relatives!!!!!!!!!!!!!!! As one of my South African friends used to say, "איפה זה כתוב בתנ"ך" that parents are obliged to buy the latest $650 dresses and $400 shoes from Parisian fashion house Lanvin for their daughters' school wear? While the report itself may be good journalism, every single one of us knows of retail outlets where we can buy good, durable and competitively priced clothes for our kids. In any case, all children rapidly outgrow their clothes and shoes, as we all realize. Walmart is just one name that springs to mind. Now, if we were to pay as much attention to שעטנז as we do to looks and labels . . .
Borech Hashem I don't have this problem and I hope my daughters won't either. By us its a bigger deal if you find something nice for pennies. What's wrong? Inadvertently (I hope) your conduct raises the bar for those around you, whether they can afford it or (usually) not. It feeds others' materialist leanings. It encourages superficiality over profundity, consumption over hessed (yeah, you can't take "your money" with you, so why not waste it? Please, there are other uses), and short term over long term (who says "your money" will last?). It gives the concept of doting a bad name. Maybe your neighbors "feel the same way" because your neighbors (& their kids) have 15 neighbors (YOUR kids) running around in expensive designer clothing! I have to disagree with Reb Yid. Envy may be the fault of the envier, but human nature is human nature. It is common enough that Hashem saw fit to remind us of it with Al Sachmod . . . .
Children are not strong enough to constantly withstand the great disparity between the haves and have nots, especially when it's so blatant. When I was in Bais Yaakov in the 1950's there were those of us whose parents were Holocaust survivors still trying to figure out how to make a decent living in America, and others whose parents and even grandparents were born in America, and who had lots more money for clothes. And they DID have nicer clothes, but it wasn't quite so glaring, the crazy differences you see today. Their things may have been slightly nicer, but not the equivalent of hundreds of dollars difference for a skirt or pair of shoes. And, this is unfortunate, but teachers also aren't immune to being impressed by money. You may not like to admit it, but it's true. I've taught for many years, and I've observed how some (of course, not all, but some) teachers are impressed by the expensive things kids have and assume the parents are baalabtim, and give those kids extra attention. You just contradicted yourself and thereby agreed with those of us who took umbrage at your barb against the Modern Orthodox. And please check post #20, the woman from Monsey. What type of name is Rivfa? I have never heard of it, perhaps you can tell us the history behind it and why you are obviously a troll. Until I started reading VIN I had never seen so many people answering to the name "Anonymous", and that number is growing B"H.
Perhaps *you* will tell us the history behind *your* carefully selected screen name, please, and why you think that Rivfa is "obviously a troll"? I would love to know what business you are in that you can afford to clothe 15 children in designer clothing. Isn't everyone entitled to spend their hardearned money however they choose? Someone spends on grand vacations, others on big size apartments in the heart of bp and willi. I for one live in a tiny one br apt since I can't afford anything else. I do choose to spend a little more though on my kids clothing, although nothing close to what's mentioned in the article. Am I not allowed to feel good SOMEWHERE?! Don't listen to the people here and do what you feel is best for you and your family. You should feel good everyplace you go! Sure you're allowed to. You said it yourself: to spend a little more on one kind of consumption while remaining frugal on the rest. Commenter 20 does the opposite, blasting through money on ostentatious clothing and, in all probability, on other things as well. $10,000 for a summer wardrobe?! for a 3 yr. old?